18.12.2013 (Hvino TOUR News). Head of the Georgian National Tourism Administration [GNTA] Giorgi Sigua presented the report of the work done by the National Tourism Administration in 2013. The event was opened by Economic Development Minister Giorgi Kvirikashvili. "2013 year was an unprecedented successful for the Georgian tourism. We have the most impressive growth across Europe. Georgia was highly appreciated in the report of the United in the number of international travels, which exceeded 5 million. Increased macroeconomic indicators deserve a special recognition, including international revenues, the share of tourism in GDP and employment. In 2014 the National Tourism Administration’s budget will be doubled and the Agency will work with redoubled efforts on three priority directions. It is the positioning on the target markets , development of tourism infrastructure – regulation and taking care of improving the quality of service, " – Sigua noted. In his words, the National Tourism Administration implemented a number of unprecedented and large-scale projects in 2013. 18.12.2013 (Hvino TOUR News). Revenues received from tourism totaled 730 million USD in the current year, Minister of Economy Giorgi Kvirikashvili said at the presentation, summing up tourism sector activity's in 2013. According to Mr. Kvirikashvili, in recent years the number of tourists traveling to Georgia has significantly increased, this year’s rate is high as well: compared to last year the number of international tourists in Georgia increased by 23% and amounted to five million. According to the Minister, the number of tourists is expected to grow by 18 % next year, while revenues from tourism should make 1.1 billion USD of the gross domestic product. 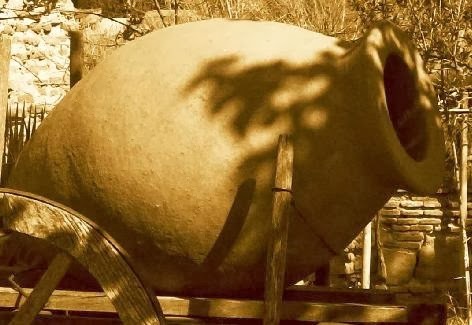 Kvirikashvili says that foreign tourists are particularly interested in Kakheti and wine tours and tourist interest and routes should grow. 16.12.2013 (Hvino TOUR News). According to Siko Gegiadze, advisor to the Chairman of the National Tourism Administration Administration, 2013 was very important for the development of Georgia’s image as tourism destination. The number of visitors amounted to 5 million this year that is unprecedented for the country. According to Gegiadze, the number of tourists increased by 57 % compared with last year. Tourists from Russia, Ukraine and the Baltic states were especially active this year. In Gegiadze's words, the winter tourist season is going well in terms of tourists inflow, Gudauri and Bakuriani resorts are working at almost 100 % capacity, and the National Tourism Administration is currently working on the popularization of Mestia resort. Next year, the Tourism Administration expects 6 million tourists in the country. 11.12.2013. The average expenditure of foreign travelers to Georgia per visit amounts to GEL 626. Russian tourists on average are the most generous visitors while Armenians, who are the majority in terms of total number of tourists in the country, spend the smallest average amount of money when staying in Georgia. Food and beverage, accommodation, shopping and entertainment are the main outgoings of visitors to the country. A total of GEL 2,841,876,840 was spent by tourists in Georgia in the first 10 months of 2013, according to data provided by the Georgian National Tourism Administration. 30% of the total amount was spent on food and beverage, 20% was spent on accommodation, 18% on shopping and 14% on entertainment. 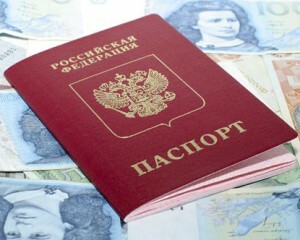 “Citizens of Russia are in first place in terms of amount of expenditure in Georgia. Per trip to Georgia they spend on average about GEL 1,180. The following places are held by visitors from Central and Eastern European countries. Tourists from these countries spend GEL 943 on average. After them comes Turkey - GEL 533, Azerbaijan - GEL 467, and Armenia - GEL 301, according to data from the Georgian National Tourism Administration. This data is from the first 10 months of 2013. 10.12.2013 (Hvino TOUR News). 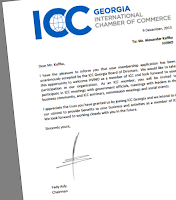 Hvino TOUR News is pleased to communicate that our parent company Hvino.com has become the member of the International Chamber of Commerce (ICC) of Georgia. 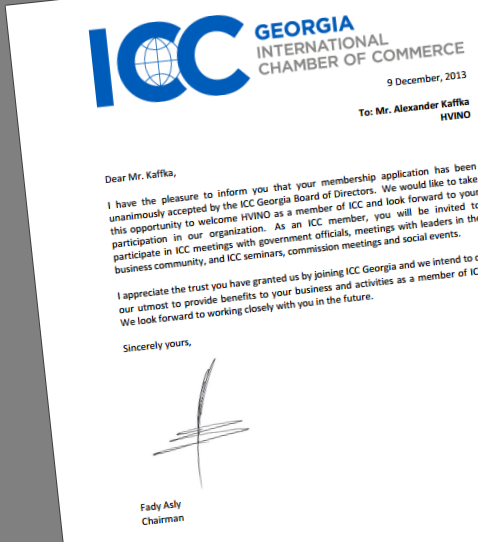 ICC is one of the most influential business associations, which unites more than hundred companies and organizations operating in Georgia, including major business players such as Bank Republic, Radisson, KPMG, Forbes. 09.12.2013.The number of visitors at the Georgian National Museum increased by almost 40,000 during the first ten months of 2013, compared with the same period of last year. There are over 188 museums established in Georgia. Meanwhile the majority of foreigners’ interest appears to be in Stalin’s museum. 09.12.2013. Nine new tourism products, which the Georgian Tourism Association (GTA) is bringing to Georgia, will be available from May 2014. The installation of special equipment for using these products has already been completed. Out of the 9 products one is totally novel in Georgia - the zip-line, which has been installed on the Mtirala Mountain in the Adjara region, near Batumi. “Bringing the zip-line tourism product to Georgia is very innovative and useful for developing domestic tourism and making tourism products more diverse,” Nata Kvachantiradze, Chairwoman of the Georgian Tourism Association said. “While implementing this project in Georgia we also thought about developing 4 season tourism in the country. Georgia will become a 4 season tourism country, which means that interest from tourists should be equal throughout spring, supper, autumn and winter. This is a challenge for the country. Currently, during the peak season demand is high, hotels are full. But when the season is over, the resorts are dying. We should do our best to attract tourists after the season ends. The hotels are overloaded during summer while they are empty in winter. In such a way business cannot develop properly in Georgia. Time is required to adequately plan out activities for the off-peak period, which is the responsibility of both the state as well as us. It could involve cultural or MICE tourism for example,” she added. 08.12.2013. The number of international travellers in Georgia will exceed 6 million in 2014. This year Georgia has had 26% growth of tourism and was named the star performer by the World Tourism Administration. GEL 15 million is the minimum budget of the GNTA for 2014. The booming prosperity of the sector is delivering a good message to investors; however Georgia is facing a lack of hotels . “In March 2014 the hotel Rooms will open in Tbilisi . The hotel will have the same concept as it has in Kazbegi. Radisson Park Inn, InterContinental, Rixos and Hilton are all upcoming projects. Hotel Ambassador is building another hotel in its neighbouring territory. Together with boutique and middle class hotels , more than 100 new hotels will be opened in Georgia in the next two years,” Giorgi Sigua, Head of the Georgian National Tourism Administration (GNTA) said.